played on the dulcimer on the original track. 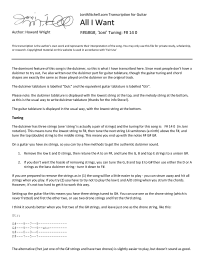 way to write dulcimer tablature (thanks for the info Steve!). the middle string. This means you end up with the notes F# G# G#. G, B and top E strings to a unison G#. string - tune it down to F#. Setting up the guitar like this means you have three strings tuned to G#. other two, or use two drone strings and fret the third string. is slightly easier to play, but doesn't sound as good. choice whether you use two drone strings or two melody strings. I've written separate lines for the dulcimer tablature and guitar equivalent. the line marked "Dulc" if you're playing a dulcimer. Because the two instruments are fretted differently (e.g guitar fret 2 is equivalent to dulcimer fret 1) you will get some very odd chords if you play the "Dulc" tablature on the guitar! changes - i.e I won't write out all the multiple strums of each chord. record to get the full picture.